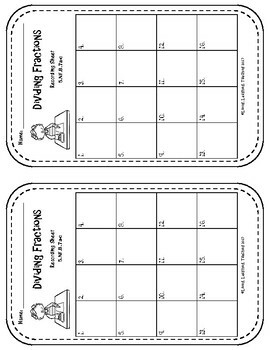 This Dividing Fractions packet includes task cards for a math center, Keep-Change-Flip mini poster (half sheet b/w for math interactive journal) and 3 separate dividing fractions word problems for math interactive journals. Two different versions of the word problems are provided. First version is a half sheet that provides enough work space to solve the problem. The second version are quarter sheets to save on paper. Students can glue them near the top of the page and use the area below to work out the problems. 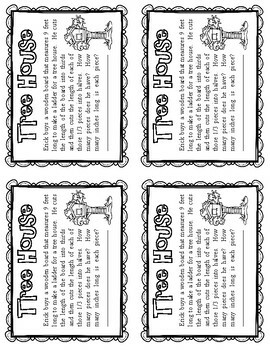 These worksheets are printer friendly since they are in black and white. Answer keys are also provided for all the worksheets. 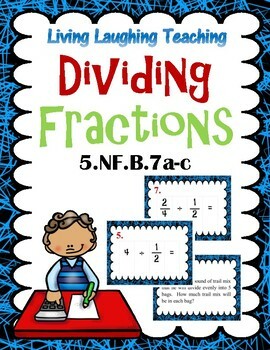 This pack also includes a set of Task Cards that can be utilized as a math center or for early finishers. 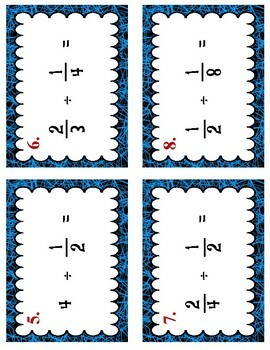 The task cards are provided with minimal color to save ink . A recording sheet and answer key is also provided for the task cards. * Keep, Change, Flip half sheet for Math Interactive Journal. * Answer Keys to all worksheets and task cards. Copyright © Living Laughing Teaching. All rights reserved by author. This product is to be used by the original downloader only. Copying for more than one teacher, classroom, department, school, or school system is prohibited. This product may not be distributed or displayed digitally for public view. Failure to comply is a copyright infringement and a violation of the Digital Millennium Copyright Act (DMCA). Clipart and elements found in this PDF are copyrighted and cannot be extracted and used outside of this file without permission or license. Intended for classroom and personal use ONLY.